Before cable television, a politician’s fibs could take a few years to catch up with him/her. In the age of instant replay and You Tube, we have seen the media expose a lie quicker than you can change the channel. “Hang’em high” mobs are already planning replacement parties for Senator Dodd (D-CT) and Treasury Secretary Geithner. The fallout from the AIG bailout has left many not trusting any words uttered by our elected officials. 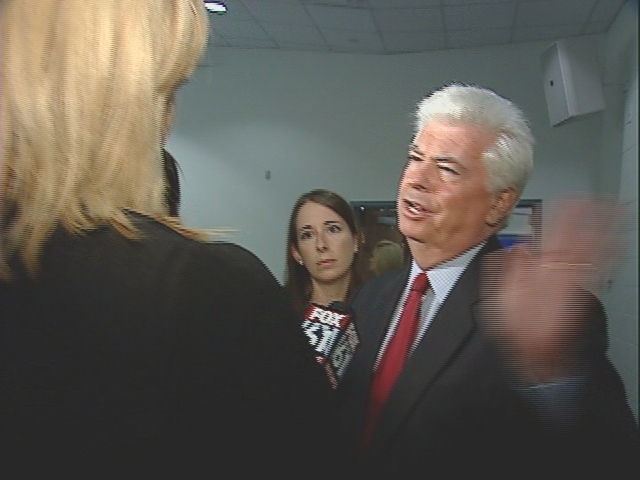 Senator Dodd outright denied having anything to do with the changing of the bill regarding AIG executive compensations. He was the first to go on record regarding the matter. Before he could reach for his Grecian Formula, CNN and other media outlets were researching to find out who changed the provisions in the bill that allowed bonuses to executives who were responsible for the derivative mess in the first place. Derivatives are generally used as an instrument to hedge risk, but can also be used for speculative purposes. AIG took unnecessary risks and did whole lot of speculating. By the end of the night, the media had zeroed in on two individuals: Senator Dodd and Treasury Sec. Geithner. Both denied responsibility and pointed the finger at the other. When the wash was hung out to dry, Dodd tales were very dirty. AIG contributed more money to Dodd’s campaign than any other elected official. AIG is headquartered in Connecticut. Dodd had changed the bill at the eleventh hour. In true drama queen fashion, Senator Dodd was on the early morning shows the next day giving “what-had-happened was” type statements. He was shown his previous declarations of innocence over and over and asked to explain himself. His interviews should be mandatory viewing for anyone considering public office. By the end of the day, his white hair was turning yellow from the glare of the camera lights. He was caught. He knows it. And we know it. “Gotcha” journalism, which is often used for sound bites to mislead and misinform, worked in this case. The public was not being feed the truth. American taxpayers are outraged and taking their disgust to the streets. Currently, Senator Dodd is Chairman of the Banking, Housing and Urban Affairs Committee and sits on the Rules and Administration Committee. Both committees are very powerful and will have a crucial role in how our economy recovers from the previous administration’s eight years of spending, deregulation, and two forgotten wars. * Banks, banking, and financial institutions. * Control of prices of commodities, rents and services. * Economic stabilization and defense production. * Export and foreign trade promotion. * Federal monetary policy, including the Federal Reserve System. * Financial aid to commerce and industry. * Issuance and redemption of notes. * Money and credit, including currency and coinage. * Public and private housing (including veterans housing). * Renegotiation of Government contracts. * Urban development and urban mass transit. (2) Such Committee shall also study and review on a comprehensive basis, matters relating to international economic policy as it affects United States monetary affairs, credit, and financial institutions; economic growth, urban affairs, and credit, and report thereon from time to time. As our lawmakers fight to save many banks and a few homes, Senator Dodd will be a central figure in the process because of his rank in the Senate. He will chair oversight for many of the projects that are being funded by the stimulus package. He not only chairs the committee that deals directly with the housing and bank legislation, he is on the committee that oversees investigations of illegal allegations of our elected officials. Essentially, he will police himself. A blind man can see the conflict of interest in this situation. As we are protesting and demanding the heads of the AIG and taxing bonus payments that were legally approved, I suggest looking at the committee members that rushed to sign a bill KNOWING AIG and other institutions were going to receive funds that would make a mockery of the bailout. Our law makers are placing a higher priority on bailing out corporations and taking care of the top 10% of income earners in the country than creating jobs and real economic development for Main Street. Members of the House and Senate should receive Oscars for the feigned shock and awe that is being directed at AIG. This is business as usual. Senator Dodd is exposed and the public has been educated that we must truly read the fine print. Hopefully, the next bill will not cost us $165 million to learn what is in it. To my friends in Connecticut, start the party. Genma Holmes is the author of the blog Genmaspeaks. Based in Nashville, she is a mother, entrepreneur, writer, activist, philanthropist, model, actress, speaker, political watchdog and news junkie. Gemma, That youtube and cameraphones are going to be the death of a whole lotta folks. Good post, thanks for the information. It was interesting to learn the scope of the authority of the first committee of which Dodd is chair.